State Representative Allen Andrews of Northwest Missouri’s Grant City is among the state’s lawmakers digesting the news of Gov. Eric Greitens’ indictment. Andrews says he was in a meeting with the governor’s staff when the indictment was announced last week. On Thursday, a St. Louis City grand jury indicted Greitens on a felony invasion of privacy charge. The 12-member panel found probable cause to believe Greitens violated a statute when he allegedly took a photo of his undressed mistress without her permission, and then transmitted the image. “Regardless of the outcome, the citizens of Missouri deserve to have a governor who they feel confident in placing their trust,” Andrews says. The alleged crime happened in 2015 when Greitens was preparing a run for governor. The indictment does not include the woman’s accusation that the governor threatened to blackmail her if she spoke of their affair. The governor’s attorney has asked for the charge to be dismissed and Greitens calls the indictment politically-motivated. 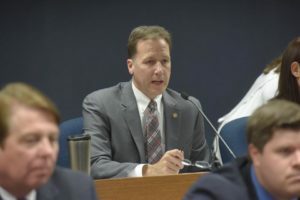 Under Missouri state law, a potential impeachment process of the governor would begin in the Missouri House of Representatives. “As the details of the investigation continue to unfold, House Leadership is in the process of examining the facts of the indictment and will determine the next steps from this point,” Andrews says. A statement from House Speaker Todd Richardson, R- Poplar Bluff, Speaker Pro Tem Elijah Haahr, R-Springfield, and Majority Floor Leader Rob Vescovo, R-Arnold, says they will “carefully examine the facts contained in the indictment” and determine whether the governor can lead while a felony case moves forward. It says the group will create a legislative panel “to investigate these serious charges.” They did not go as far to say whether impeachment proceedings will occur. Greitens’ attorney has hired a lobbyist – presumably to fight a potential impeachment. According to news reports, State Rep. Kevin Engler, R-Farmington, says a letter is circulating among Republicans urging Greitens to resign. Brent Barnett of Missourinet affiliate KMA in Shenandoah, Iowa contributed to this story.